On September 13, 1971, my Buffalo National Guard unit entered Attica State Prison where the prisoners had rioted and seized hostages. After the violent retaking of the prison by New York State Police and Correction Officers, we were given stretchers to carry out the wounded and entered the prison yards where we became witnesses to a carnage that still shocks despite the intervening decades. I recounted my experience in an article in Guernica (guernicamag.com, September 15, 2011), but what I saw was only a minute piece of a vastly larger canvas. 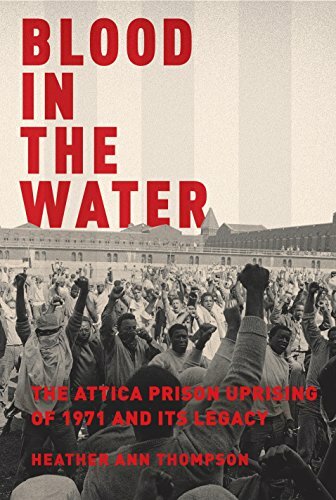 That larger picture is fully realized in Blood in the Water: The Attica Prison Uprising of 1971 and Its Legacy by Heather Ann Thompson, a historian at the University of Michigan who spent ten years researching and writing this magisterial work which won the 2017 Pulitzer Prize in History. The Attica inmates seized the prison after the authorities turned a deaf ear to their requests for reasonable improvements in the conditions of their incarceration. Negotiations to bring this uprising to an end faltered when one of the hostages died and amnesty became an intractable issue. Governor Rockefeller, his eyes set on high office, refused to aid in a resolution. In the ill-planned and excessively violent retaking of the prison, the bullets of the troopers and correction officers were the cause of almost all of the hostage and inmate deaths and casualties. Then the troopers and guards took reprisals and tortured many of the prisoners. To build cases to prosecute the prisoners, many were subjected to coercive and even physically abusive interrogations. At the same time, a massive coverup by the authorities tried to conceal criminal acts by troopers and guards. Prosecutions were selective; inmates were indicted but cases were for the most part not built against the troopers and guards. Finally, the decision was made that no one (not even prisoners already convicted, usually by questionable testimony) should be punished. Civil suits brought by the prisoners took decades in the courts and ended with a monetary award but no apology from the authorities. And the authorities finally settled with the hostages and their families after trying to trick them out of compensation. The book ends with a brief epilogue discussing the impact of Attica on American prisons in the nearly half century that has passed since 1971. Unfortunately, the author concludes that reforms brought on by Attica were brief and today our prison system is one of mass incarceration that is especially damaging to African-Americans and continues many of the abusive practices the Attica inmates sought to reform. Blood in the Water is a grim read, filled with firsthand accounts of horrific violence and torture. Racism plays an ugly role as does official malfeasance by many in positions of power. To see dead bodies piled up, the many wounded, and the hundreds of naked men in the prison yards captures only a moment in a drama with roots before Attica and consequences long after. The story is filled with the drama of large events and badly damaged lives. In every facet of this retelling, Blood in the Water captures those terrible dramas. It also has a message for us today. The media at the time of Attica related stories of hostages who had been castrated and had their throats cut. In fact, these stories were not true. In today’s parlance, they were “fake news” but the negative image of the inmates remained in the public mind long after the truth about indiscriminate shooting and use of excessive force was brought forward. What happened to the prisoners was “cruel and unusual punishment” and their rights to due process of law were violated in many different ways (including by the cover-ups). At the least, we must be vigilant in weighing what we hear and passionate in insisting on legal safeguards for the least powerful among us. This is not a pleasant story and the book is not a pleasant read, but it is powerful, passionate, meticulously researched, well-written, and profoundly informative.